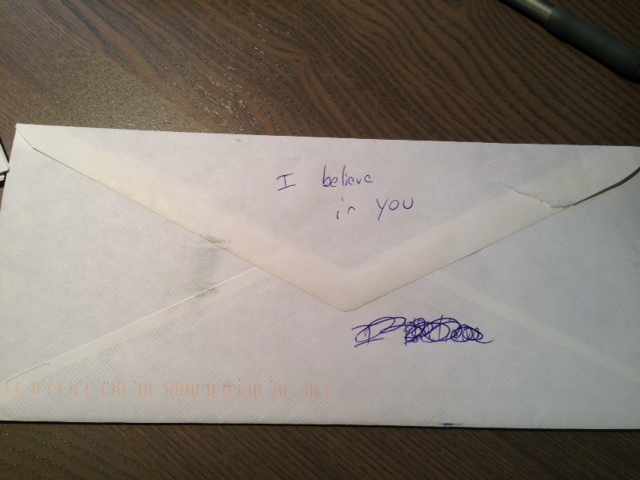 A couple of days ago, I checked my PO box and found this letter. At first, I was delighted to get a real letter. There was no return address, and the handwriting looked familiar…I puzzled for a moment about whom it could be from, then realized (with chagrin!) that it was my writing. One of my coaches, Kary Oberbrunner, had finally dropped it in the mail…and now I was supposed to open it and read it. UGH! On May 2nd, I sat on the rusted base of a “bed” (I use the term lightly) in a cell in Shawshank Prison (Ohio Reformatory in Mansfield, Ohio), and wrote myself a letter. The assignment had been given by my coach, Kary, as part of the Dream Job Bootcamp workshop weekend. I was to write to my future self to tell me what I need to know so I can move forward more successfully. I should share any advice I would give myself, any new clarity I had gained, set forth some expectations for greater accountability, or perhaps even warn myself, should I feel the need. I have to say, the whole experience — from the prison setting to the fact I had recently escaped my day job to move into my purpose / calling full time — weighed heavily on my heart. As I put pen to paper and began to write, the tears began to stream down my face. It happens when things of great meaning come to me; while I still find it somewhat frustrating, I’m used to it. I wrote and wrote and wrote, until someone’s alarm went off and I brought my missive to a close; we had been given several things to do while in the cell and a set amount of time in which to do them. It was time to reconvene. As instructed, I folded the letter, put it into and envelope, addressed it to myself, and sealed it. When I made it back to the prison chapel, I gave it to Kary for safe keeping; he promised to mail it to me within 12 months. Over the past few months, I’ve thought of the letter, wondering when it would arrive and what it would say when I opened it. Make no mistake, it’s not that I expected some other letter to be in the envelope when it arrived…I simply had no idea what I wrote. Every word on those pages flowed to and thru me, but they didn’t come from me. I don’t know how else to explain it. I won’t share the message with you; it’s personal. I will say, I have some homework now and need to connect with another Coach whose style I admire a great deal; I believe we have much in common with our down-to-earth, no BS approach to getting honest, discovering oneself, and being accountable for our behaviors. I have some questions for him. I also have a sense of peace, on another level, as I’ve had some doubts removed about my “sweet spot,” as they call it. It’s an exercise worth your time and attention. Take pen to paper and spend 30 minutes writing to your future self. What advice would you share? In what areas do you need to hold yourself more accountable? What warning would you offer to the you who may sometimes stray from the path of your true priorities. Nearly in tears because my hair stylist called in sick! Yes, this was me, some months ago. My stylist actually called in sick twice in one week…the first time, the salon called to let me know, and rescheduled me for a couple of days later. I showed up early and waited nearly 30 minutes (there was no receptionist on duty — just stylists all with clients) before someone decided to tell me he’d called in sick, again. I was so frustrated and upset, I was nearly in tears, but it’s not what you think. And, it’s not uncommon. I’ve heard similar stories from many of the women in my inner circle — and extended network — on numerous occasions. It wasn’t actually about the haircut. The root of the issue (no pun intended) is this: As usual, I had a lot going on in my life, and had waited until my hair was truly out of shape, out of style, and just downright unruly before I’d called to make an appointment, which meant about another 10 days before I could actually get into the salon. It’s not as if I wasn’t aware that within a certain number of weeks of my last cut, that my hair would have grown and would need some professional attention. The issue was I had chosen to put my needs last, after my family, my business, my personal growth, etc…Commendable, maybe, but not conducive to peace or good mental health over time. I was so looking forward to an hour of true down time, when someone else would be fully focused on me and my only responsibility was to sit upright in the chair; at that point, I needed that. So, when I finally took the time for myself and the stylist didn’t show up, I was at the end of my emotional reserves! Ladies, tell me you haven’t been there…whether it was your hair stylist, nail technician, massage therapist, or a girlfriend you were planning to have coffee or lunch with…The stars were no longer in alignment and that respite you so desperately needed evaporated nearly in an instant, leaving you frustrated, emotional…whatever the reaction, it was likely out of proportion to the actual event. This is one of the reasons I’m collaborating with Tracy Worley and Maureen Craig McIntosh to bring you Gracebreak Retreat. We are taking an intentional time out to reconnect with ourselves and other strong, talented, courageous women. We will discover our natural talents (potential) and strengths (performance), define or refine our core values, dig into the choices we make and the behaviors we demonstrate that either serve us or don’t! And we’ll connect with other women who share similar challenges in their lives, broadening and strengthening our inner circles and support network. And we’re doing this just outside of beautiful Bozeman, Montana. Do I routinely commit to things I really don’t have time for, or do not have deep meaning for me? Do I routinely put everyone else’s needs before mine? When I do take time out for myself, is it usually accidental (unplanned), late at night after everyone else is asleep, or simply because I’m desperate (and then I feel guilty for taking it)? When was the last time I truly took significant time out to reconnect with and nurture my own needs? If you answered yes to any (or all) of the first three, and you need to look at a calendar or have someone give you the answer to the last one, you need to be there with us. We’ve designed this retreat specifically for you. The truth is, you cannot give what you do not have and when your reserves run dry, you are of no service to anyone, especially you! We can’t wait to see, and serve, you there! Register today! I had the privilege of attending a business summit last week, where 800 business leaders and legislators gathered to discuss a number of issues in our state. Part of the agenda was an opportunity to get to know the candidates for our Congressional seats in the upcoming election. In pairs, these folks were given the opportunity to respond to a series of questions posed by a moderator, and one in particular caught my attention. The moderator asked: What accomplishment in your public service career are you most proud of and what would you like the chance to do over? What accomplishment are you most proud of and what would you like the chance to do over? As I listened to each of the four candidates who participated, I found myself becoming more and more disappointed in them; although it is politics, so I shouldn’t have been surprised. Pardon my disbelief, but that response left me cold. I can’t think of anyone I’ve met who has no regrets, who wouldn’t like the opportunity to do something over. This is not to say that the something has to be monumental. It could be as simple as wishing one could take back a hurtful comment made in the heat of an argument, or fueled by hurt or misunderstanding. It could be wishing one took advantage of an opportunity that had been presented, but was missed out of lack of awareness, fear, doubt, insecurity. It could be a desire to do something again because of lessons learned and a desire to do whatever it was better, smarter, smoother, etc…There are often unintended consequences to our actions, and sometimes, we would like to try, again, based on that awareness. I do understand the concept of saying “I have no regrets because I’m happy with where I am today.” I do. You see, I am very blessed to be where I am today, and looking back over the course of my life, I can see all the connections on the path to getting me here, and understand why the various experiences were necessary. At the same time, there are things I’ve done and said that I’ve deeply regretted and wish I could take back or do over, with more insight, stronger intuition, greater empathy, deeper wisdom. I’ve made apologies and amends and learned to forgive myself, but it doesn’t change the fact that I’ve goofed up, on numerous occasions, and would like to have done it better the first time. So, back to the political candidates. I assume some well-meaning communication officer or PR person told them it’s important to focus on the positive and not admit to any potential weakness or failure. I find it disingenuous. It disconnects them from the rest of us mere mortals who goof up on occasion. It leaves me feeling distrustful of them. If they can’t be open about a mis-step at some point in their life — or political career — what else will they not be honest and forthcoming about? And what will be the outcome if it turns out someone finds something in their past that they regret and would like to have done over? This is like a job interview, isn’t it? When the interviewer asks the candidate what his / her strengths and weaknesses are. The truth is, we all have both and if we attempt to present ourselves as if we don’t, we’ve planted the seeds of distrust and disbelief. It usually doesn’t go well after that. So, what about you? How would you answer the moderator’s question? What would you do over, and why?